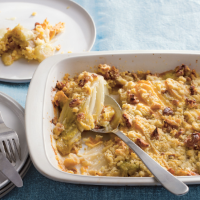 Delicious Reblochon de Savoie cheese gives this easy, baked main a fabulous flavour. Preheat the oven to 200°C, gas mark 6. Bring the stock to the boil in a large frying pan, add the chicory and leeks, cover and cook for 5 minutes. Using a slotted spoon, transfer the vegetables to an ovenproof dish and add 3 tbsp of the stock. Meanwhile, rub together the flour and butter to resemble breadcrumbs, then stir in the walnuts and some seasoning. Arrange the cheese on top of the vegetables and sprinkle over the crumble mix. Bake for 20 minutes until golden.